The next quilt up this week is a beautiful quilt from Muriel and the Honeybees of Bee Europa. 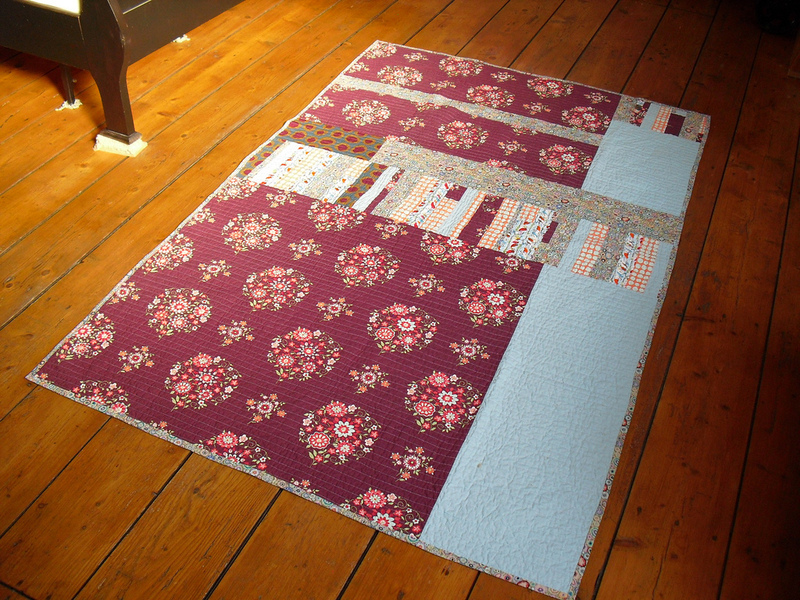 I made this quilt using blocks that were made by the members of the Honeybees of Bee Europa in 2010. I ask them to make wonky quarter log cabin blocks and in our Flickr group I provided a link to a tutorial. 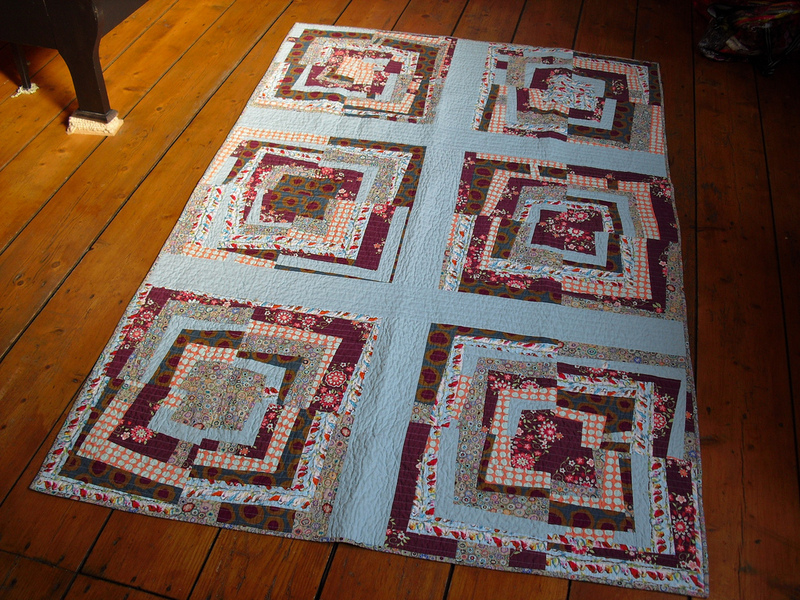 When I picked the fabric for this quilt I started with the burgundy Amy Butler fabric with flower rosettes. I chose other fabrics to match the colors in the inspiration. I sent each of my fellow bee members strips of fabric and fabric for the block centers. They were then free to make the blocks however they wanted. I received two 12 1/2″ blocks from each member. 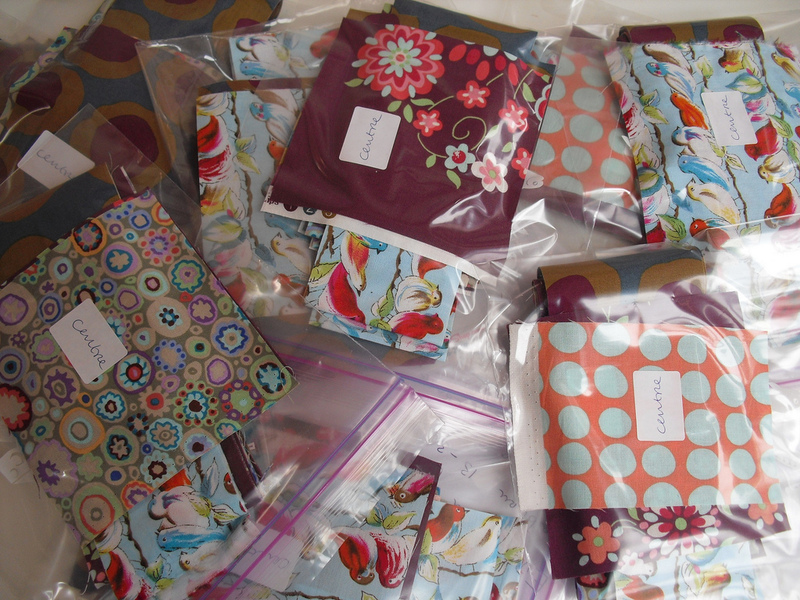 Fabric packs for bee members. I put the blocks together to form huge full log cabin blocks and added sashing. I made the back for the quilt with leftover strips and yardage that I saved. The quilt is a favorite in our house; when we watch television, my children fight over who gets to sit under this one. Tell us about your thoughts on virtual quilting bees and your bee experience. The bee that helped me make this quilt was my first bee. It was the first round of this European group and it is still going strong. We are starting on our third round soon. After this bee I have joined many others, all through Flickr: the 3×6, and 4×5 mini bees, Sew Buzzy, and the Cocorico Patchwork Bee where we are getting very creative and are making our own patterns inspired by wonderful themes such as vintage kitchen or Pippi Longstocking. I am also a member of the Do Good Stitches charity bee. 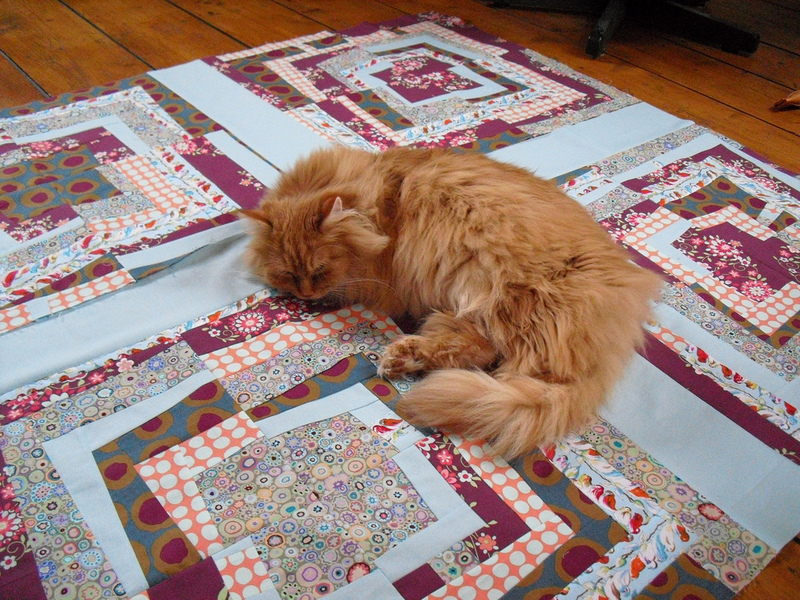 Muriel's quilt in progress with a little help from a friend. I think virtual quilting bees are a fun and easy way to get connected with other quilters. In my non-internet life I don’t know anyone who quilts, so these bees are a community where I can share my work with people who can appreciate all the aspects of it. Also, bees provide the opportunity to make one or two blocks in a certain technique without having to make a whole quilt. They are a great learning experience. The back of Muriel's quilt. Everything that I know about quilting I have learned through the Internet, through virtual quilting bees, quilt-a-longs and online tutorials. I love soaking up the knowledge there is to be found and then continuing in my own way. Not having a quilting tradition in my family or community means that I don’t feel much pressure to follow rules. I love selecting fabric for projects and playing with colors. I love combining florals with geometric prints and I am very interested in folklore patterns. My latest interests are foundation paper piecing, sewing curves, and exploring what makes things cute! You can find Muriel on Flickr and on her blog, Doucepoints. this is a wonderful quilt! I love the gigantic blocks!